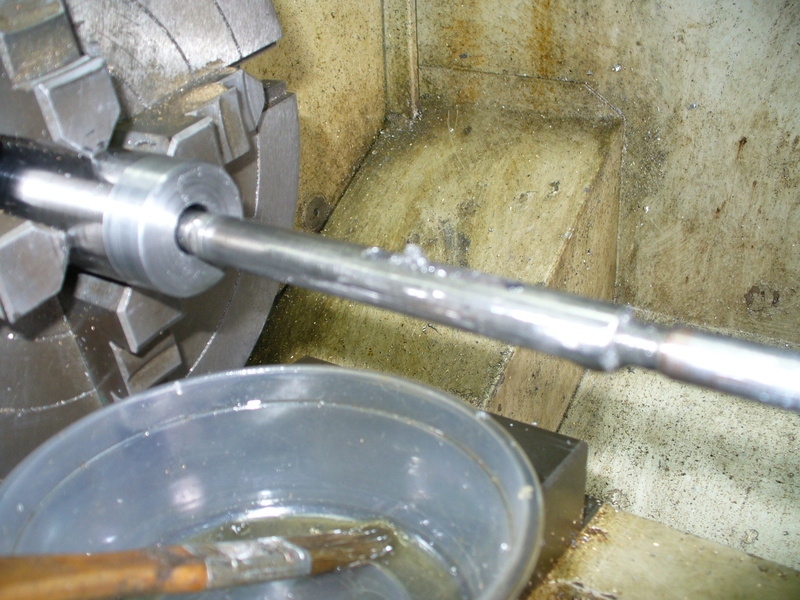 I know this is getting boring but have just bored out a .443" hole in my last bit of 4140 steel shaft and rifling it to a 1-18" twist, it`s a hard job but some one has to do it. . It will be 27" long, 1-1/4" od and may be good for heavy lead slugs at 200m ?. Are you going to rebarrel the sharps? Ha ha "boring" I will never tire of seeing your cool projects, keep posting pics please. Beaker, Tommy and Cordite like this. OK OK, Here`s a close up and personal look at the rifling system, first pic is the rear end where the cutter is pulled through the barrel. 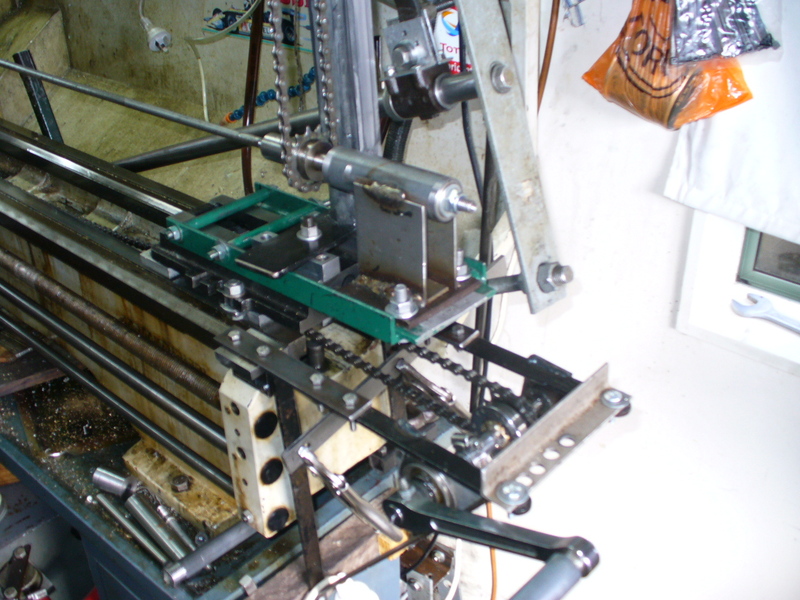 You can see the sine bar and slider assembly and the crank with chain loop that pulls the lathe bed slider along. 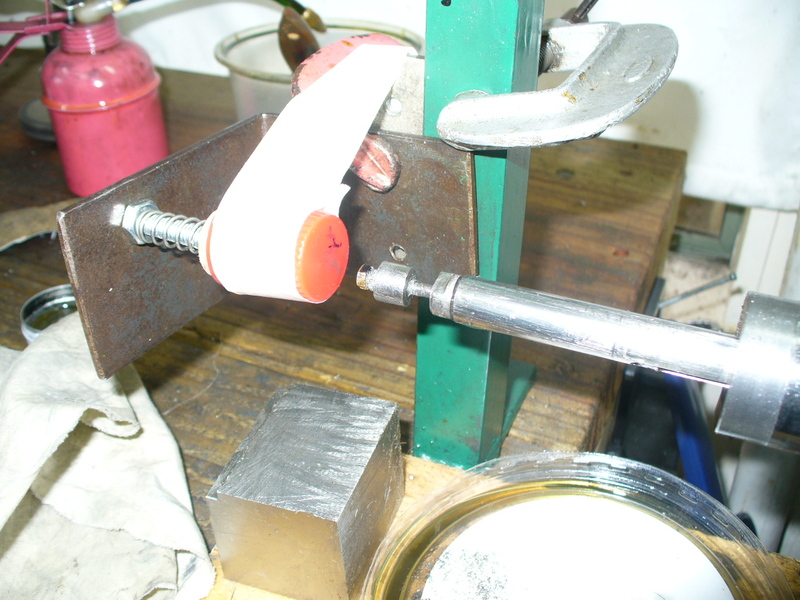 The top of the chain loop is bolted to the slider and goes back and forwards driving the rifling cutter rod. 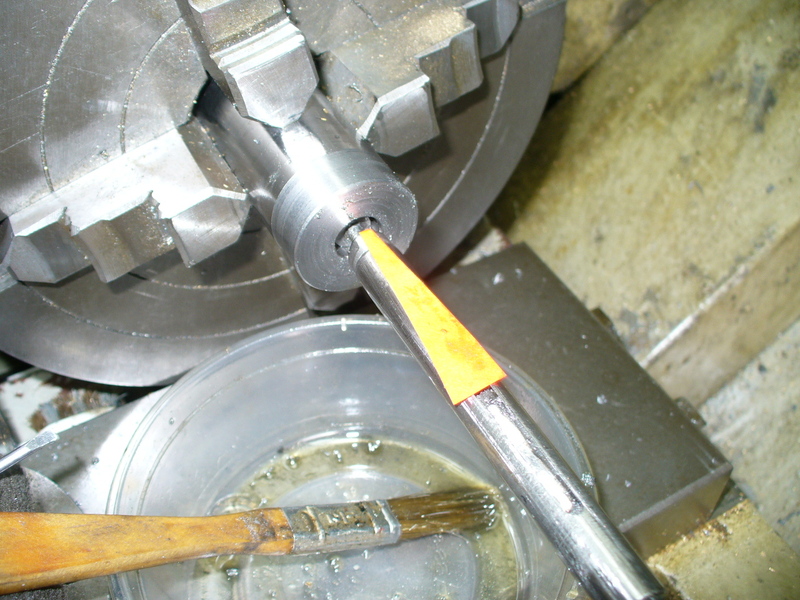 Now the rifling cutter head has been pulled through and you can see shavings by the cutter. To go back the cutter is lowered by pushing the adjustment nut, Arrowed, back out, this lowers the cutter down for going back. There`s a ramp inside the head for raising the cutter up and down. .
That should take you awhile to finger it out. I've heard of halfshafts being used. I suppose with the right set up they could be used, but I think they are hardened so no good for cut rifling and the time it takes I don`t need to practice. 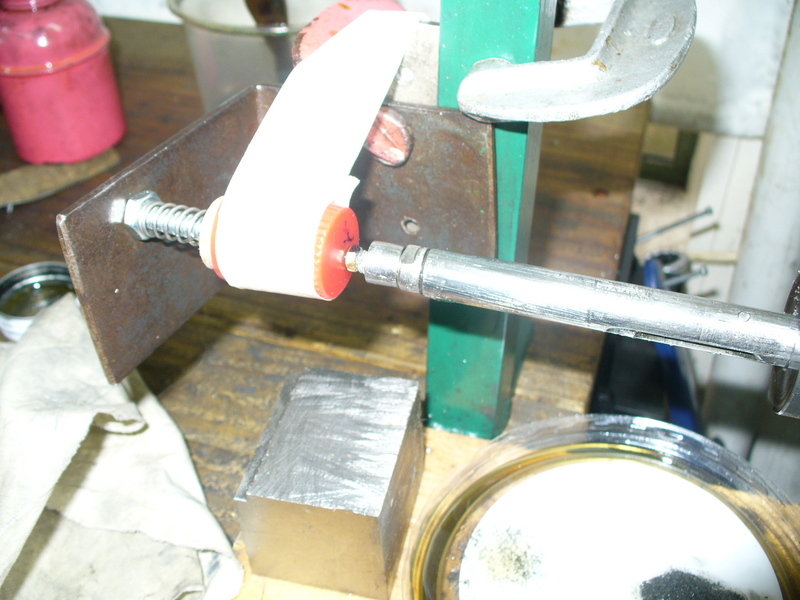 Maybe after I wear out the Sharps barrel Ill make a new one, it`s in the to hard basket at the mo. This one will go to a new home as it`s hard to get large calibre blank barrels in NZ without exporting them, lots of $$$$. 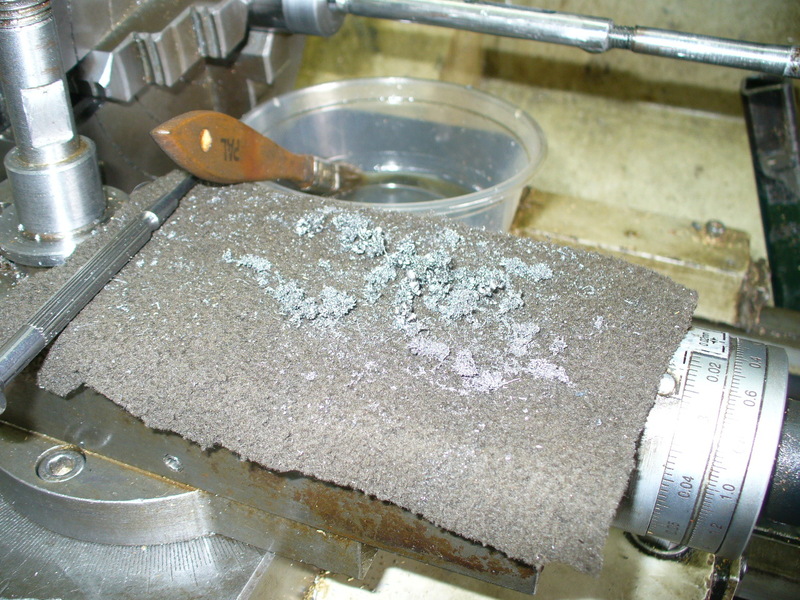 The rifling cutter is adjusted very finely so it just shaves a fine swarf at number one grove, then all the rest are cut at the same setting, six in all and then the cutter is raised a snig and away you go again, pile of fine swarf. The r/head is cranked back to the breech end, it hits a stop to raise the cutter and away you go again. 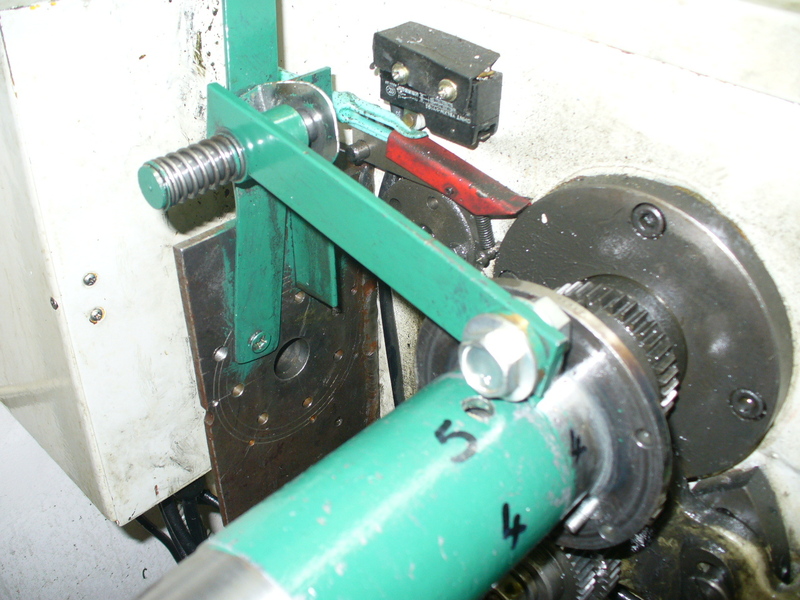 At the back of the lathe is the setup for rifling register of the six groves, a bracket with a arm is bolted in place and the arm has a pin that locates and locks in a round disc with the evenly spaced holes. Starting at number one each grove is cut till no more swarf comes out, then on to the next one. 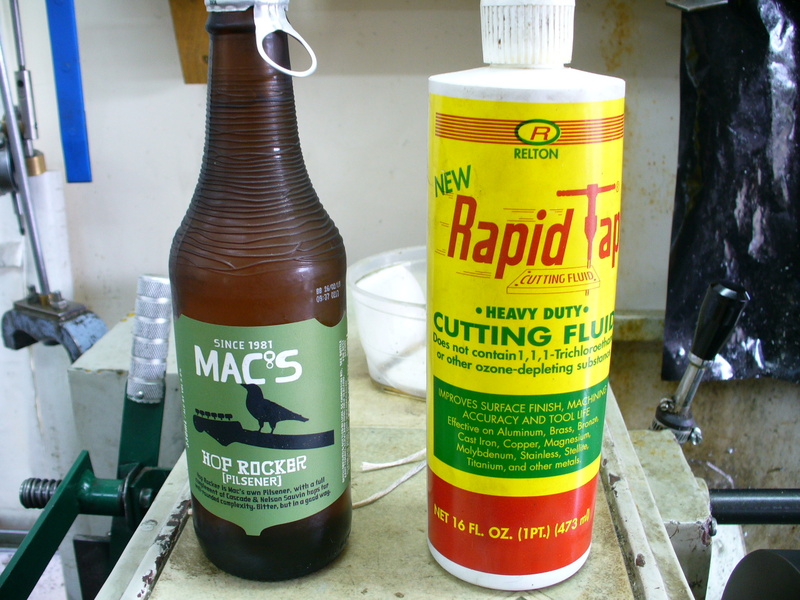 When the cutter comes out the swarf is removed and cutting fluid is applied for the next cut and a supply of lubricating fluid is on hand for the operator. mikee, Scouser, 257weatherby and 3 others like this. You know I`ll have to agree with you, I`m slowly improving my system and thought the fast twist would cause problems ,but no and I`ll have to say this is the best barrel I have done. I`m very tempted to replace my Sharps barrel with it or being a nice guy sell it for a NZ Hogziller killer project for someone as being a clever bugger I can make another one. A crappy pic of the bore. takbok, ChrisW and 2post like this. And yes there`s always something that goes' wrong, the oil pump I got from my son`s Kanga is no good, so Tommy, (or any one) you don`t happen to have a S U V power steering pump laying around. I've got a Nissan car one that I get 200psi ,so another one should be 400+psi range, that is what I want. If I followed your process correctly, wouldn't your 6 th groove not as deep as the first one if you take into account cutter wear? When I used to regularly visit Border barrels in Scotland, I think that his Pratt and Whitney rifling machine was indexing the barrel at each pass of the cutter, and after 1 or 2 full revolution the cutter was self setting out for the next set of passes. That way the wear is even on all the grooves . By the way, if you happened to wear out a .458" barrel, don't throw it away, just rebore it to the next caliber ,(475 or 50) and rerifle it. There are two or three companies in the USA who offer reborring and filling services. Well no, my state of the art cutters are made from T C tipped saw blades and as I`m hand cranking slowly through the barrel with my top of the range C N C set up there`s no wear on the cutter. My system for cutting is, remove chips, glug of brew for operator, cutting lube on cutter, wind through, another brew shot for operkator, crunk it brak , knok ouf ships, a shot of cutting oil for the operratee asd a slug of brew on the slutter. , So the`s nothing thass caun posy ges wroung. muzr257, Scooby, mucko and 6 others like this. 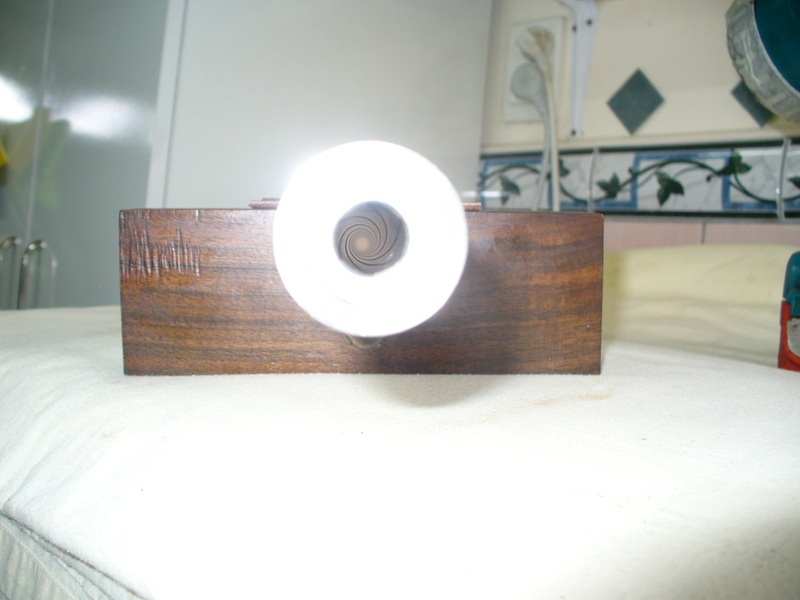 By Yorric in forum Questions, Comments, Suggestions, Testing.